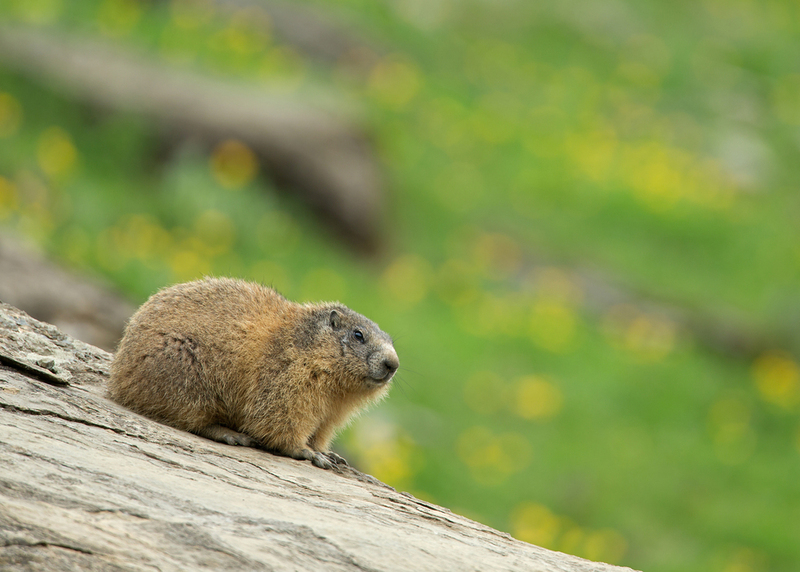 ALPINE MARMOTS HIBERNATE FOR NINE MONTHS OF THE YEAR so are not available for photography for long! The same was true of my session with them, only about 15 minutes of which was mist and rain-free. There wasn't much light available either, so again I resorted to slow shutter speeds and even live view for such a stationery mammal. I was surprised to learn that they had been reintroduced to the Pyrenees in 1948 after a long absence, since the Pleistocene in fact! The small group I was able to photograph from a hide were a bit sluggish in the cool weather and disappeared down their burrows once the rain started leaving me watching the mist for almost four hours. The marmots usually make much more interesting subjects interacting and fighting etc. My boredom thankfully relieved by a few alpine breeding birds that showed up in front of the hide including Ring Ouzel, Water Pipit and Black Redstart, although it was far too murky to bother with a photo of any of these.